Thank you for helping a pit bull in need. ACPB is a small organization with only 10-15 dogs in our program at a time, and we started because we were once independent rescuers like you! While we want to help everyone, please understand we are entirely volunteer-run and we often have our hands full. We thank you for your patience and understanding in advance. 1. Send us a photo and bio of the dog you are networking and we will post him/her on our Facebook page, Petfinder, and Adopt-a-Pet. We recommend a high-resolution headshot, taken outside, in shade, on the grass. A happy smiling photo attracts positive adopters! Include a bio with the dog's age/weight/energy level, if he/she is good with kids/dogs/cats, how he/she walks on a leash, and any other personality traits to describe the dog to potential adopters. Above all, be positive - words matter. Check out these great writing tips from Animal Farm Foundation. 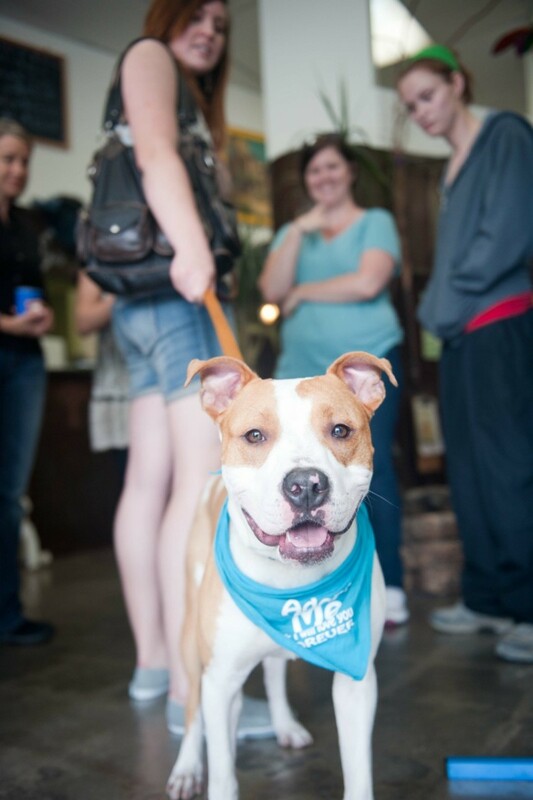 Send your dog's photo and bio to COURTESY@angelcitypits.org to get started. Make sure to also share your dog on your own social networking sites (i.e. Facebook, Twitter, Tumblr, etc.). Online networking is amazingly effective, so use it to your advantage. Handlers: Please wear secure shoes and be in control of your dog at all times. Please maintain a 10 ft distance between dogs. Practice calm, positive reinforcement. Bring treats! Health: All dogs must be in good health (no fleas, worms, kennel cough, etc) as well as be current on vaccines, and spayed/neutered. Equipment: All dogs at our events are required to wear a martingale collar. If your dogs pulls on a leash, we ask you to use a gentle leader. If you must use a corrective type collar, please talk to us about this in advance. Behavior: In order to ensure the safety of our visitors, we cannot allow dogs who are aggressive to humans at our events. It is okay if a dog is SELECTIVE with other dogs. Please see this guide from Bad Rap about dog tolerance levels. Know where your dog falls on this spectrum, and be honest with us in advance. All dogs attending an adoption event should be prepared to put their best foot forward. For this reason, your dog should be manageable and not reactive on leash. If your dog is reactive on leash, we recommend group class training classes to help address your dog's anxiety. Also, keep in mind there are MANY dogs at this park, and it can be stressful for dogs with insecurity issues. If your dog has trouble behaving, and the event is too stressful for him/her, please don't make him stay. Dogs who are acting out can stress the other dogs out, and it doesn't help anyone to get adopted. Paperwork: Please print and bring you own Adoption Application and Contract in case you meet an interested adopter! Below are two generic forms you can use. You can also feel free to print some training guides for your packet and see PBRC for a helpful home visit/check info sheet as well. Signature: We ask all independent rescuers and handlers of Courtesy Listed dogs to sign a Volunteer Release form before joining us at one of our adoption events. Thank you in advance for your cooperation. View our Facebook album to see our present Courtesy Listed dogs.